It is no secret that we love our cupcakes. We have explored many a tasty treats within the area and beyond. Still, our love for a cute pink truck has us watching to see what new and exciting things will be available. When we heard that Fluffalicious was getting a new home, we waited to hear the news of their grand opening. That happened last weekend and we were not able to make it. Though we just went, we may have to go again next week for Small Business Saturday. While TechyDad’s parents were in town, we decided to head over to the new Fluffalicious store. As we pulled up, we knew we were in the right place. We saw the Fluffy truck outside, and pink on the side of the building. When we went inside, the boys did not know where to begin. They love the cupcakes from Fluffalicious, but had never SEEN them like this. 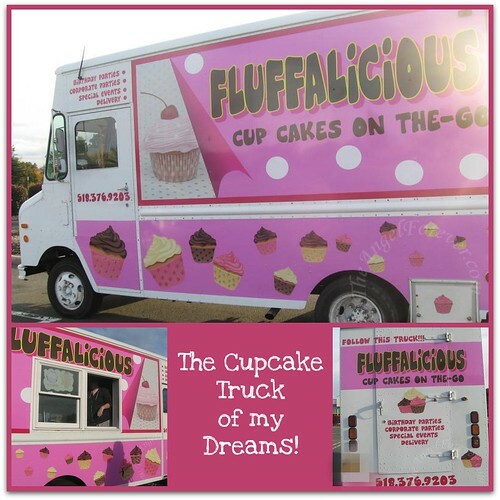 When the cupcakes are in the pink truck, you are not able to view them and pick based on the look, just the sound and flavor. As we were trying to pick things out to take home, I recalled a Tweet that I had seen. The Tweet mentioned that they would have Cherry Cheesecake Cupcakes ready at 3:00. It was just before that, so I asked. Sure enough they were ready. In the end we picked our four cupcakes. JSL wanted Triple Chocolate. NHL wanted the Hot Fudge Sundae. TechyDad and I wanted to try one of the Cherry Cheesecake and Boston Cream. Check out the beautiful cupcakes below. We all enjoyed the items that we selected and I am sure we will be heading back to Fluffalicious one day soon. Thank you for making these fantastic treats.